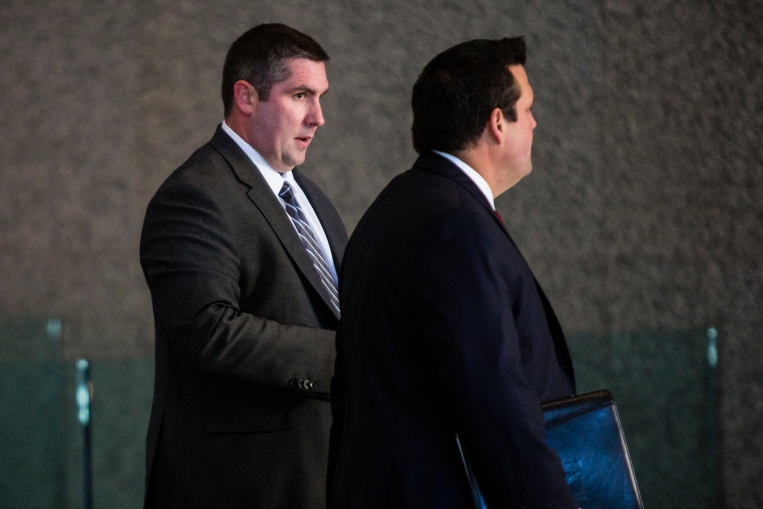 Chicago Police Officer Patrick Kelly (left) enters the Dirksen Federal Courthouse on Tuesday. One is retired from the Chicago Police Department. One remains on the force. Both wound up on a witness stand Tuesday, in separate courthouses across town. And in a sign of the contentious atmosphere that surrounds policing in Chicago, both men wound up exercising their Fifth Amendment right not to testify — a combined 32 times. “On the advice of my attorney, I invoke my Fifth Amendment rights,” retired Det. Reynaldo Guevara said once at the George N. Leighton Criminal Courthouse. 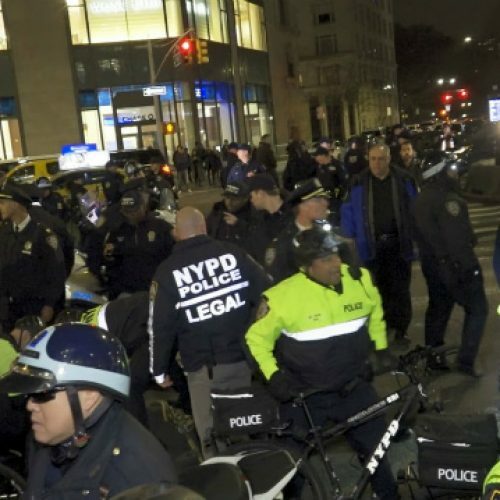 “On advice of counsel, I exercise my constitutional right to remain silent, per the Fifth Amendment,” Officer Patrick Kelly said 31 times at the Dirksen Federal Courthouse. The coincidence of Kelly and Guevara refusing to testify on the same day comes as Chicago continues to struggle with police reform. Mayor Rahm Emanuel recently promised to dedicate $27.4 million to the topic in his 2018 budget proposal. The mayor has also promised to work with Illinois Attorney General Lisa Madigan toward federal oversight of the Chicago Police Department. Several community groups have filed lawsuits to force a consent decree, as has Madigan. Kelly landed on the witness stand on the most dramatic day so far in a contentious trial over the Jan. 12, 2010 shooting that left his friend, Michael D. LaPorta, permanently disabled. LaPorta was shot in the head with a bullet from Kelly’s service weapon after a night of drinking with Kelly’s work friends. CPD is taking a second look at the shooting, which occurred in Kelly’s home. 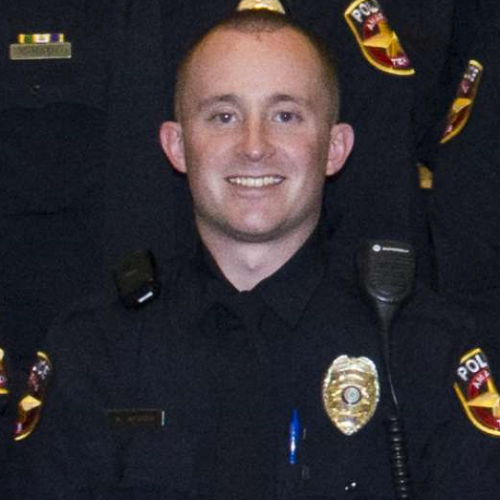 Kelly remains on the force but has been assigned to administrative duties. LaPorta followed Kelly to the witness stand Tuesday. But before either man could appear before the jury, Kelly’s attorney asked if Kelly would be allowed to remain in the courtroom after he took the Fifth — possibly forcing LaPorta to testify in front of the man he claims shot him. Kelly’s lawyer, Anthony Monaco, denied it. “That’s outrageous,” Monaco said. When Kelly took the stand, he refused to answer questions about whether he shot LaPorta and tampered with evidence. He sometimes paused to cough and drink from a water bottle. When he was done, he calmly left the courtroom, buttoning his gray suit. Afterward, jurors heard the contents of an earlier deposition in which Kelly said he saw LaPorta holding the gun to his left temple with his left hand. Kelly said he heard the gun click and then tried to grab it with his right hand. 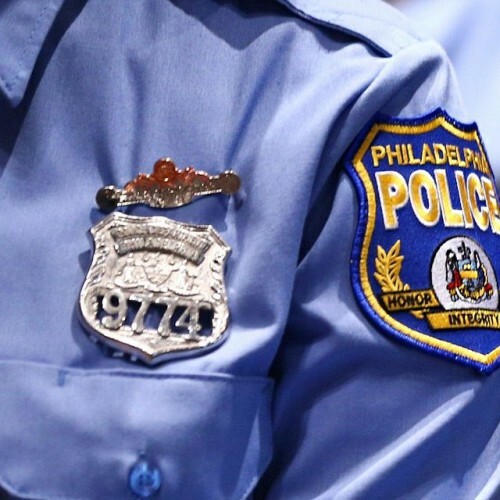 The gun went off with his hand about six inches away, he said. Later, LaPorta testified in a quiet voice from his wheelchair, struggling at times to find his words. He said he learned to shoot when he was 7 and held his guns with his right hand. He also said that, on the night of the shooting, he had praised Kelly’s dog, which Kelly had been hitting. LaPorta denied shooting himself, and he agreed with his lawyer that Kelly was the only other person in the home at the time. “I know he shot me,” LaPorta said of Kelly. Across town, Guevara testified in a post-conviction hearing for Gabriel Solache and Arturo DeLeon-Reyes. The men are serving life sentences for a 1998 double murder they say they didn’t commit. Solache and DeLeon-Reyes said Guevara beat them and bullied them into confessing.